Ensure a good and safe working environment for our employees. The working environment initiatives should primarily be of a preventive nature to prevent potential work-related injuries. The concept of playing, learning and engaging communities to be physically active are the cornerstone of KOMPAN’s philosophy. 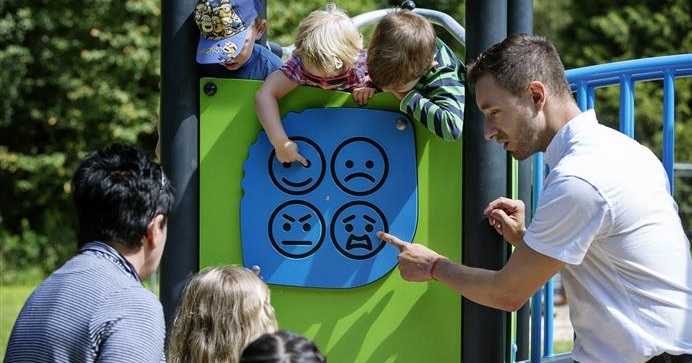 KOMPAN, through its mission of creating healthier and happier communities, is committed to deliver curriculum compliant and age appropriate play and exercise equipment, which must be demonstrated in four areas. Firstly, play value must makes the child and adult “want” unknowingly to undertake the play activity to cater for physical, cognitive, social and emotional development. Secondly, holding power must hold a variety of inspiring and fun activities that can take place in one solution; continuously offering a challenge or new experience. Thirdly, we commit to deliver Universal Inclusive Play to accommodate activities that are relevant and fun for all children and fourthly, we must support public safety in any of our designs. We aim to actively fight all kinds of forced labor by: Ensuring that all employees have employment contracts or are subject to agreements that specify their terms of employment and terms of termination, showing the voluntary aspect of the employment. This also applies to companies, which supply goods to KOMPAN. In special circumstances, employment of children at the age of 14 is possible, if this is allowed according to ILO convention No. 138, and if local conditions mean that having a job the child will have the best possible protection and development. However, the job should be a light and secure part-time employment and education should be provided at the same time. In case of employment, it should take place in close cooperation and dialogue with the child and his/her family as well as with approved international or national organizations that safeguard the interests of children. Being reluctant in the use of health tests. Only the most necessary tests required by legislation or by the employees should be carried out. Health test shall not be used for discriminatory purposes. Corruption is one of the most substantial obstacles to free trade and also the biggest threat to eliminating poverty in the world. Therefore KOMPAN will work against corruption and bribery.